Unnatural disasters have become a fact of life dependent upon fossil fuels. The latest of these disasters came early Monday morning when a coal slurry impoundment at the TVA Kingston Power Plant near Harriman, TN burst, allowing approximately 500 million gallons of toxic coal ash to rush into the surrounding community. Prior coal slurry disasters in Buffalo Creek, WV and Martin County, KY were significantly more deadly and damaging, despite being just a fraction of the volume. The fact that there were no serious injuries is perhaps the only victory in this ordeal. Such terrible acts are far from divine. Instead, they are the direct results of negligent corporations and lax government regulations, which even at their most strict, have failed to fully protect those who live downstream and downwind from such places. And while the outcry has been widespread, it still doesn’t seem apparent that those citizens in Tennessee, or in any of the other areas affected so adversely by mountaintop removal, will be cared for properly or treated respectfully by those in power. The evidence that current policy is not adequate enough to protect both citizens and the natural environment is overwhelming. This just does more to quiet the myth that coal can ever be ‘clean’ – whether it’s in extraction or burning, you can’t make the dirtiest source of energy on the planet anything but. Even if you make them sing Christmas carols. Coal ash is NOT more radioactive than nuclear waste. The concerns are chemical, not nuclear. 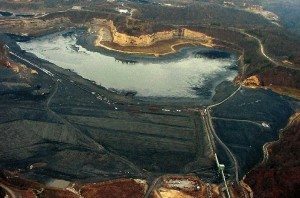 Arsenic and mercury are in the coal ash and can get into water sources, which is still potentially an environmental nightmare, but the Scientific American article you link is very misleading about radioactivity. Please see my fisking of the nuclear concerns. now the spill is up to ONE BILLION gallons. and–BTW wulf–the article says coal is POTENTIALLY more radioactive. latest news about the spews…the MSM is now realizing it’s a big story. Some people have the idea that you can take the coal slurry and inject it into spent oil wells and after a time it will convert back into oil. Its sounds better than storing this waste in giant ponds.